Well, nearly two years later, I’m back. I’ve been derelict in my blogging (derelict may be too kind a word for my negligence)—so much so that I considered deleting this blog altogether, coming up with a fresh new name and re-launching. But we have so much history together—this blog and me and all five of my formerly-faithful readers—that I decided I’d take the risk and dive back in full force. And making a return couldn’t come at a better time in the life of a blogger than preceding a great adventure: I’m moving to Switzerland! Now, obviously, it’s no coincidence I’ve decided to blog again right now. But I’m hoping my content will be so inspiring, witty and downright fascinating (per the usual ;) that you will forgive me and join me on the journey. I wouldn’t want to take it with anyone else (well, except maybe him). But I digress (Well, not really. 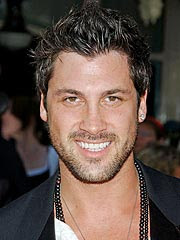 Maksim Chmerkovskiy is no digression!). Ahem. Moving on. Let’s do a quick re-cap of the last two years so we can move on and get this party started! I’ve opted for one of my favorite formats: the top-ten list (which may or may not include ten things.) Without any further ado, here are some of the moments of the last 24 months that in some way—big or small—changed my life. These are in no particular order, by the way. It sounds so innocuous to write “insomnia” that way, but up to this point in my life, I’ve never experienced anything more challenging, disheartening or all-consuming. I learned a lot about myself, my God and my true friends through the experience. And I can honestly look back and say that I am a better person for it. I know I wasn’t easy to be around during that period, so to all of you who stuck with me, joined me for caffeine runs, forgave my forgetfulness, made me laugh, laughed at me when I needed it, and showed me what it means to really be held up and supported through a difficult time—thank you. I truly couldn’t have done it without you. The beginning of my love affair with New York City. “Concrete jungle where dreams are made of, there's nothing you can’t do, now you're in New York. Really, that’s how it made me feel. Something came alive, and I’ve been longing to go back ever since. Who knows what that means, other than trips to NYC as often as time and money allow... There’s something about finding that place that really speaks to your soul. I feel so alive when I’m walking the streets of New York. It’s good to have a place like that to go and be rejuvenated. Hearing these words from my boss: “Carly, there is an opportunity for you to work in our Basel, Switzerland office on a project for about four months. Is that something you’d want to do? After I thought about it for all of 0.000000001 seconds, the answer was clear: a VERY professional “HECK YES I DO!!!!!!! !” I’d like to say it was more dignified than that, but I really don’t think it was. Deciding that I do want to apply to graduate school, making the decision on my major (Journalism, in case you were wondering) and taking the GRE. That’s three things, but they’re all connected. I’ve realized this year that I really love to write and edit—I’m passionate about it, and (if I do say so myself), I’m good at it. Maybe that’s an atypical thing to love, but it’s me. I also really love to learn how to be a better writer and editor. Why not learn how to be better at my passion while getting my master’s degree at the same time?? It seems like a no-brainer, so I’m going to apply for the Fall 2012 semester and see what happens. Taylor Swift’s Speak Now CD. Don’t judge me—for the fact that I still buy CDs or that I announced to the blogging world (and probably not for the first time) that I love T-Swift. She may be a little crazy; she may even be a terrible live singer. But by God, she can write music that gets to the heart of things, and as long as she does that, I’ll be a fan. Also, she dated Taylor Lautner (team Jacob!) and Jake Gyllenhaal (team Jacob part duex? She must have a think for that name). If you can’t respect her music, at least respect that. I hope this doesn’t sound trite, but these past two years I’ve grown closer to my family than I ever imagined. Not because I didn’t think we could be close, but because I thought we already were about as tight as a family could be. But my relationships with my mom, dad, Nick and Pete have each grown in ways I hadn’t even considered they could. We’ve become more than family—we’re friends. I can’t think of any greater gift. Well, I think I’ll stop there for now, and leave you with a song. It’s called In Your Arms by Plumb. I’m not sure at this exact moment what these lyrics are speaking to me, but the song is incredibly stirring—and it’s more than just my love for her voice ... Enjoy the playlist, enjoy these lyrics, and most of all, come back and visit. I am committing to blogging at least once every other week from this point on (and there will be fewer gratuitous pictures of my celebrity crushes, because I'll have awesome new pics of my own to share! Note that I said fewer, not "none." I gues a part of my will always be 10 :). My goal is to blog once a week, but I don’t want to be overly ambitious and disappoint. Under-promise; over-deliver: That’s my motto. Let the angels sing Hallelujah! She's back, ladies and gents, and better than ever. YAY!